Don’t know about you, but I’m getting really sick of winter. Seems the only time the sun shines is when it’s too cold to go outside. So here’s something to look forward to, even if it is several months away. The Historic Motor Sports Association (HMSA) has declared Ferrari to be the feature marque at this summer’s 2014 Sommet des Lègendes, to be held July 11-13 at the Circuit Mont-Tremblant. They’re expecting to have Ferrari makes that have competed in the FIA Manufacturers Championship of Makes (Testa Rossa, 512 series, 250P series, etc. ), as well as production based Ferrari race cars from the ‘60s and ‘70s (250 GTO, 365 GTB/4 and BB/LM) on the track. A Ferrari only race is in the works. Of course there won’t only be Ferraris out, cars from all the HMSA classes are welcome. See their website for details, but that includes early Grand Prix cars and both purpose built and production cars from the ‘50s, ‘60s and ‘70s. More information can also be found on the Circuit Mont-Tremblantwebsite. I see they have a few other events scheduled, including a Spring Classic on the May long weekend, and a Ferrari Festival in late June. Okay, this isn’t exactly rare, given that they built nearly half-a-million of them between 1963 and 1976. It is a bit unusual though, in that it’s a mass-produced rear engine car. The car at Beaulieu may be the first ever built, bearing chassis number 6 and body number 1. 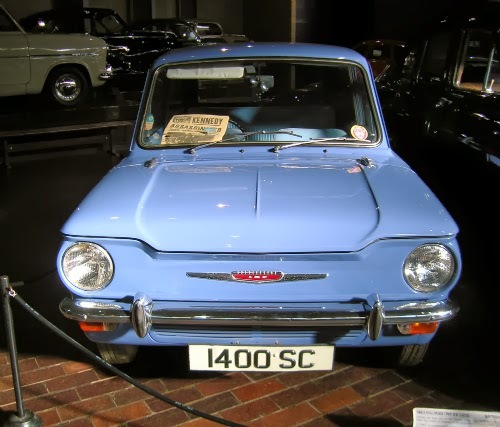 According to Wikipedia, the original version of the car, a saloon (we’d call it a sedan on this side of the pond), had a rear window that opened and a rear seat that folded down, features normally found only on bigger cars at the time. There were some problems with the earlier cars as they were rushed into production. While later cars were reliable, the damage had been done, and the Imp never became the rival to the Mini that the manufacturer had hoped for. 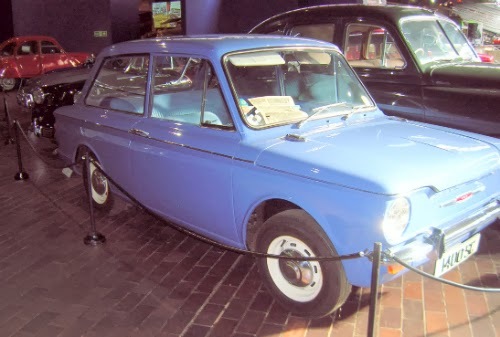 There’s an interesting article on the history of the Hillman Imp on the Telegraph site. pinball machine and the original pony car. Several months ago, I’d talked about the 50th anniversary of the Ford Mustang and some of the merchandise being licensed to celebrate it. Well, here’s something different from the usual clothes/mugs/key fobs. 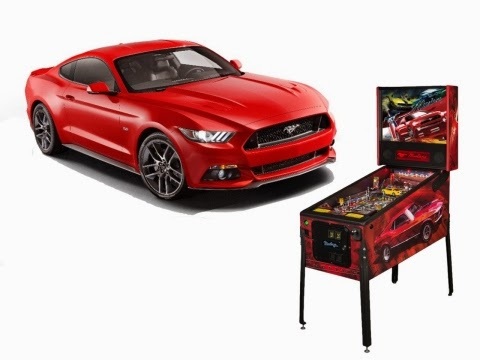 Stern Pinball is producing three different Mustang-themed pinball games. Okay, it’s more like one game with three different versions, but still pretty cool. The premium edition has the Mustang Boss 302, 351 and 429 from 1969 to 1971 and 2012 to 2013. The limited edition has both the original 1965 Mustang and the current 2015 version, plus it’s signed by game designer George Gomez. Both have real Mustang badges on the speaker grilles. Sounds like the perfect thing for a man cave or a garage. You can see more photos and even buy one from the Stern website. Not surprising for a British museum, the National MotorMuseum at Beaulieu has a lot of Austins. 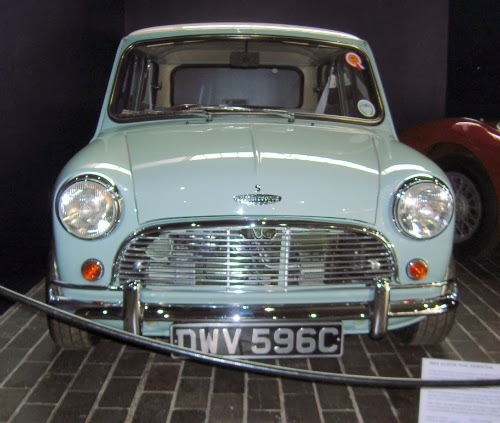 Today I’m featuring a 1963 Austin Mini Downton. No, no connection with popular TV series Downton Abbey, a fictional estate in Yorkshire. The Downton Minis hale from Downton, a village in Wiltshire. Tuners are nothing new. The Mini hadn’t been out very long when people discovered what an amazing rally car it was. It was even better with a few tweaks, and one of the best tweakers was Daniel Richmond. He was so good at modifying Mini Coopers with competition engines and other performance parts that the British Motor Corporation, then owner of the Austin marque, gave him a consulting contract. Soon the rich and famous were buying the Downton Mini Coopers. People like Steve McQueen, Dan Gurney, and Enzo Ferrari. You can find Downton Engineering Works online. While they are a ‘90s relaunch of Richmond’s company, they did start business with some of the original employees. It doesn’t look like they’re doing much at the moment—the page says they currently have no cars for sale and are not taking on new clients. They do have some merchandise available, including Downton badges, shirts, and several books on Minis. Their webpage also has an interesting history of the original company, complete with photos, one of which shows Enzo Ferrari with his Mini. Saw an ad for this pop up in Facebook and thought those of you in the Montreal area might be interested. The Motorcycle Show – Montreal will be on from February 28 through March 2 at the Palais des congress. Adult admission is $14.50, kids aged 6-14 are $9 (free for the under six crowd) and you can get a family pass for two adults and two juniors for $37.00. Friday, February 28, is She Rides Night, with women getting in for half-price after 5 pm. Kids from 6-12 can take part in the Yamaha Riding Academy for Kids (some conditions apply), where they’ll be given safety tips and a chance to ride a Yamaha TT-R off-road motorcycle under safe conditions. While the Riding Academy is free, your kids may want you to buy them a motorcycle after their experience. Lots of manufacturers will be exhibiting their motorcycles, ATVs and scooters, including Arctic Cat, Harley Davidson, Honda, Kawasaki, and, of course, Yamaha. There will also be exhibits for accessories, clothing, and even travel. Might not be riding weather out there yet, but that’s no reason not to start planning. This is not the car I think of when someone says “Triumph.” In fact, I’d never even heard of it before. However, there are lots of details, including rally history, a database of known existing cars, and old commercials aimed at both consumers and dealers, on the www.triumphherald.com website. 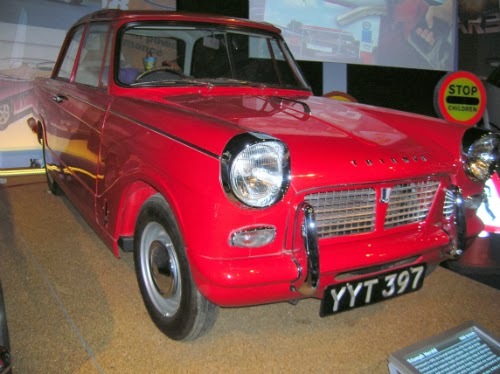 A few basic facts: Built in Coventry by the Standard-Triumph Company, the Herald first appeared in 1959 as a replacement for the Standard 10, and was manufactured right through to 1971. Seems about 500,000 or so were produced over that time period, many of which were exported, some in “complete knock down” form to be assembled at satellite factories elsewhere. Continuing with the cars that caught my eye at Beaulieu, here’s an Austin Seven from 1959, built by the British Motor Corporation. 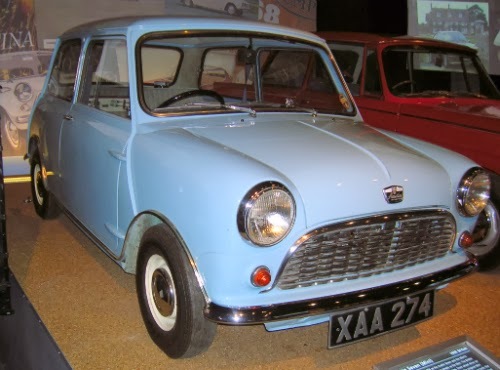 While there have been a lot of Austin Sevens over the years, the 1959 version was actually the first Mini (it was also sold as the Morris Mini-Minor). This particular model is one of the oldest Austin Minis still in existence. 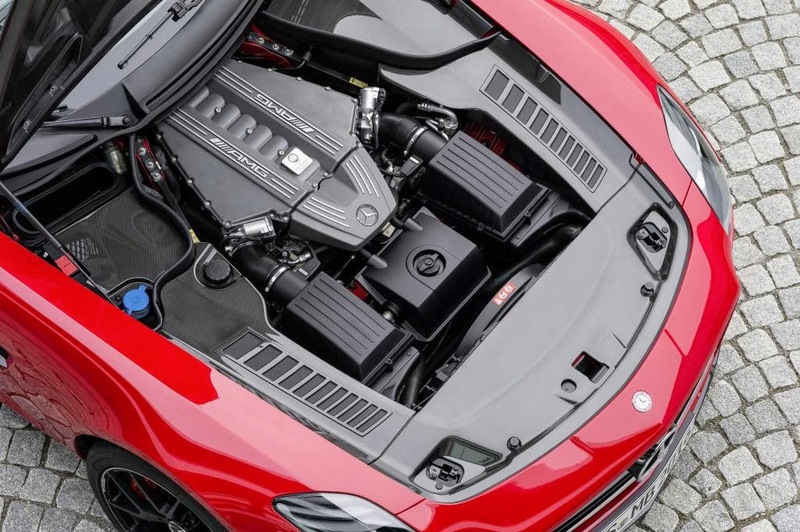 Under the hood is an 848 cc four cylinder capable of 70 mp, that put out 34 bhp at 5,500 rpm. New, it would have run you around 540 pounds. Unlike today’s MINI, it was an economical car to buy, at least if you bought the base version (mirrors, radio, heater and seat belts were all extra). It was also quite innovative in its day. Designer Sir Alec Issigonis used a front-wheel drive layout that opened up space in the interior compared to other cars of the same size. My dad owned a couple of Minis when I was little, a Mini Cooper, and later a Mini wagon, so I’m rather partial to them. Don’t know what model year his first was, but there are photos of it from 1964 so it has to be a Mark I. Continuing with my series on the National Motor Museum in Beaulieu, England, here’s a 1956 Austin-Healey 100M. According to the museum’s placard, this particular car belonged to the Earl of Wharncliffe, and competed in hill climbs. While there’s only a 2660 cc in-line 4 under the hood, that doesn’t mean it’s got no juice. It’ll do 118 mph and puts out 110 bhp at 4,500 rpm. 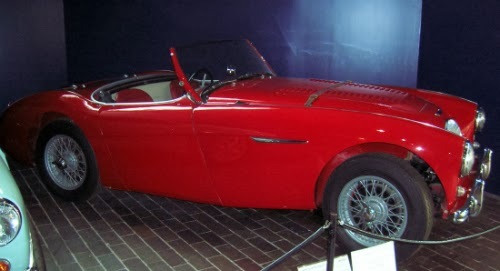 Wikipedia says designer Donald Healey based the 100s on the existing Austin A90, and was planning to produce them at his own company but the original model he built for the 1952 London Motor Show caught the eye of Austin’s managing director, so he arranged to have Healey build them at the Austin plant in Longbridge. Fourteen thousand, six hundred and thirty-four 100s were produced from 1953 to 1956. The “100” moniker came from the fact that the car could do 100 mph. “In 1955, a 100M model was developed as well, with larger carburettors, a cold air box to increase air flow to the carburettors, high-lift camshaft and 8.1:1 compression pistons…. The front suspension was stiffened and the bonnet gained louvres, along with a bonnet belt.” Obviously a sportier version. While some cars came out of the factory that way, it was also possible to buy a conversion kit (the Le Mans Engine Modification Kit) and either install it yourself or get the dealer to do it for you. I’m guessing the Earl’s car came that way from the factory—there were only 640 of those. RM Auctions sold one last summer for just under $200,000. See pics and details here. The Austin-Healey 100 was available in two-tone, but I think the straight red looks just fine. 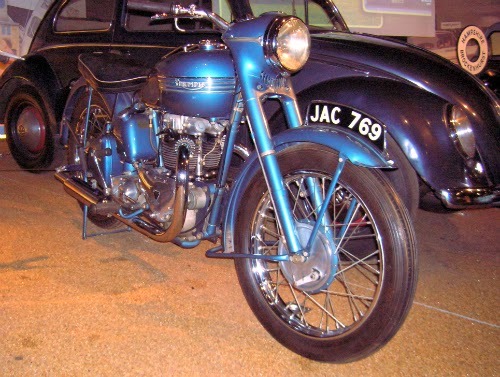 1949 Triumph 6T Thunderbird at Beaulieu. About a year ago I spent a few days in London, and took a side trip to the National Motor Museum in Beaulieu. While I did do several blogs about the Museum, it seems I never finished my series. So, picking up where I left off, here’s a classic British motorcycle, a 1949 Triumph 6T Thunderbird. The manufacturer is the Triumph Engineering Company Limited. According to Wikipedia, Triumph originally made bicycles (it was founded in 1885 and started building bicycles in Coventry in 1889), and began producing motorcycles in 1902. There’s been more than one change of ownership since then, but Triumphs are still being built today. A lot of them were built for the Allies during the First World War. After that, the company history gets complicated. But yes, it is the same company that made Triumph cars. The company was split in 1936, with one half continuing with motorcycles while the other concentrated on cars. They both ran into financial trouble between the war and were bought by other companies. Just like many of the post-war British cars, the Thunderbird was designed for the American market, based on the already successful Triumph Speed Twin. With a 650 cc 2 cylinder engine, it could do 90 mph. And the Thunderbird name? They ended up licensing that to the Ford Motor Company. New, this bike would have run you just under 200 quid. For more information on the Triumph Thunderbird, check out http://www.classic-british-motorcycles.com/triumph-thunderbird.html. available as a Coupé and Roadster. Photo courtesy and copyright Daimler AG. I was reading in the February issue of Motor Trend (yes, I know the March issue is out, but I’m behind) that the 2014 SLS AMG will be the last. Ack! Noooooo! Not that I could ever have afforded one, but I’ve been lusting after that car since I first saw one four years ago at the Montreal Auto Show. At least they’re going out in style. The Daimler AG press site says they’re producing a limited edition of 350 (that will include both coupe and roadster) to be known as the Final Edition model. While they’re not slated to hit the showrooms until March, Motor Trend noted and I agree that they’re probably already all spoken for, even with a price (in Germany) of just below a quarter of a million Euros. 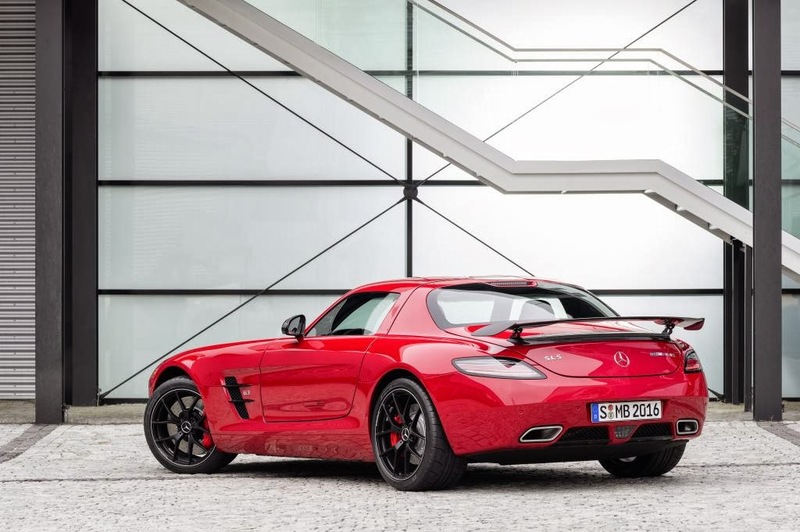 You can get a "regular" edition 2014 SLS. 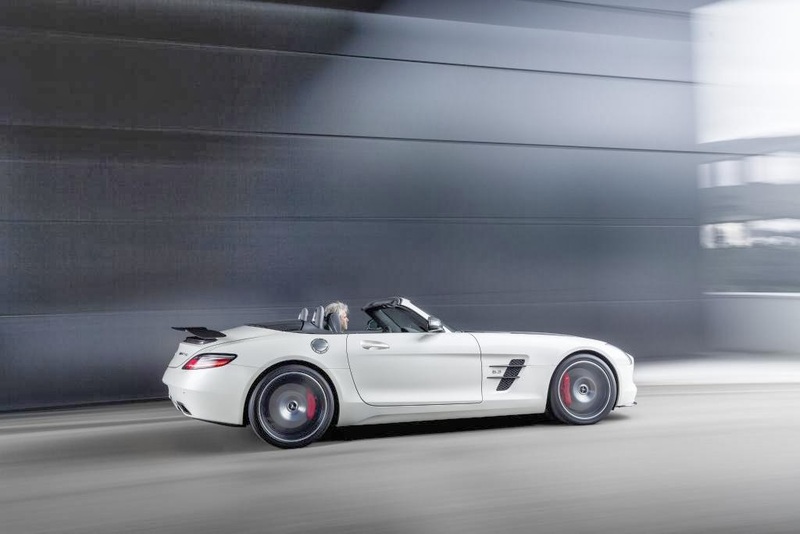 It is listed on the Mercedes-Benz Canada website with a base MSRP of $217,900. Still out of my reach, though. Several expensive options, many involving carbon fibre, ratchet that up still further. What I can’t figure out is why this is the end. Admittedly, it’s a niche market, but the car is an icon. Most of us will be lucky to see one, let alone have the chance to drive one. So I’ve grabbed a few photos off the Daimler site for us to look at, and will definitely be reserving a parking spot (or two, it does come in both coupe and roadster) in the virtual garage.